How Much Does it Cost to File Divorce Papers? Fees and other costs are inevitably part of divorce. The fees vary by each state and county court; in addition, legal fees charged by attorneys for assistance with the filing vary widely. If the divorce is contested, or if you have to negotiate terms, the time and money it takes to complete the process will increase. Divorce is a civil matter that requires the adjudication of a local court. To begin a divorce case, you must file a petition for dissolution of marriage with the clerk of court of the county in which you reside. 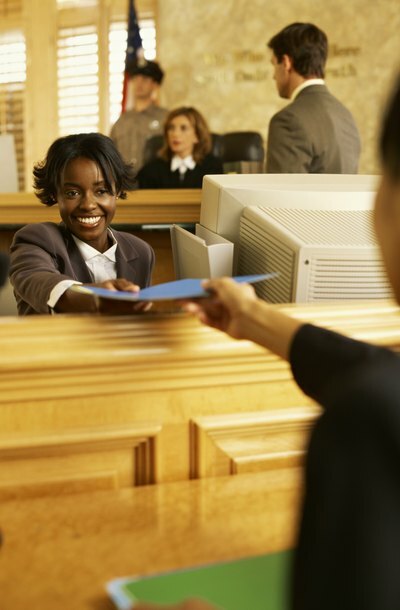 Each court imposes a filing fee, which varies according to your location but averages about $300 nationwide. The charge may be less if you file the petition electronically via a court website. The court may charge additional fees if you require certified copies of the petition, and for any additional motions, requests, proposed orders and petitions that you may file in the course of the divorce proceedings. If you have an attorney draw up your divorce petition, you must allow for attorneys' fees and costs in addition to the filing fee. Divorce lawyers may charge a flat fee for a simple, uncontested divorce; or they may charge an hourly rate for their services in a more complicated case that requires additional time, court filings, and an appearance at a hearing. Hourly fees depend on the lawyer's experience, the local average for attorney fees, and the expenses for the work of paralegals and other staff. When you file a divorce petition, you will also need to serve the case on your spouse. Service means the delivery of the petition, either in person or by mail, to your spouse. Normally, you or your attorney submits the petition and a summons to the sheriff's department for service by law enforcement personnel; alternatively, you may arrange to have a private process server carry out this step. Your spouse may also be willing to acknowledge the petition in writing and waive service. Service of process fees generally run $50 or less; if you cannot find your spouse for service, you must pay a fee for publication of the divorce as a legal notice in a newspaper. You may be able to avoid filing fees by submitting a fee waiver petition along with your petition for divorce. A fee waiver petition is a request to file paperwork without the required fees imposed by the court. You will have to sign an affidavit that you are without means to pay the fees, fill out a statement of your assets and income, submit evidence -- such as bank statements, utility bills and pay records -- to the court and, in some jurisdictions, appear at a court hearing. Lawyers.com: How, and How Much, Do Lawyers Charge? If you would like a divorce but have very limited financial means, you may be able to file the necessary papers without paying the court fees. Most civil courts have provisions that allow the indigent to carry out some basic legal procedures. Every jurisdiction has its own guidelines for waiving fees. Carefully follow the instructions provided by your local court clerk for this process. To legally change your name, you must file a petition in the court of the county where you reside. The clerk will require identification, and schedule a hearing in front of a judge or magistrate. Each court has its own filing requirements and procedure, although all bar a name change for the purpose of fraud or evasion of the police. All will require a filing fee and additional costs according to these requirements. Is There a Way to Get a Free Divorce in West Virginia?